Simply chop or slice your favorite veggies, toss them in the pan, and place it on the grill along side the main entree. All the grilled flavor with none of the hassle of turning small vegetable pieces. Made of 430-grade stainless steel. 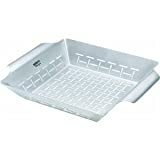 Weber Style 6434 Professional-Grade Vegetable Basket (UPC 077924074882) is sold at the following online stores. We've find the latest prices so you can compare prices and save money when making your purchases online. Please click on the links below to browse to each store's webpage.